Welcome to Step 1 of integrating your Google account with ProSpace. Hello! Welcome to ProSpace, you are currently viewing our help desk. 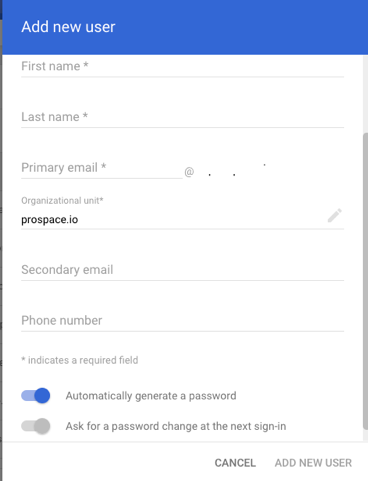 The steps below will guide you on how to integrate your Google account with ProSpace. If you would like to integrate your ProSpace account with Microsoft, please click here. ProSpace help desk is here to ensure that your integration process is smooth and seamless. If you have any question, please do not hesitate to contact our support team. The G section in the document indicates that the step needs to be completed in Google. The P section in the document indicates that the step needs to be completed in ProSpace. Before we start, please make sure that you have a ‘Super Admin’ Role. When pairing with ProSpace, we recommend that you create a generic Booking Account. This will ensure that your personal calendar is free from other’s event. In order to complete these steps you have to be a “Super Admin” in Google. When you are already one, follow the steps below. Log in to your Google Account. Ensure that you have a “Super Admin” status, and click the “User” icon. You will be directed to the page below, click the yellow button. A form will appear, fill in the details, and click “ADD NEW USER”. Congratulations! You have just created a generic Google booking account. Wasn’t that easy? Next: Giving Your Generic Booking Account a Super Admin Role.